It's back, dood! The SRPG that never fails to mess with our minds and constantly challenges us to reach levels over 9000 has returned. With a level cap of 9999, we're talking about Disgaea, the Prinny-infested series that can't help but make us feel like hanging out in the Netherworld. The fourth entry ups the ante: there's a whole new story focus on political corruption, more difficult and outrageous levels than ever before (better exploit those Geo Blocks! ), and genuinely unique online features. Plenty will be familiar for Disgaea veterans, but there are lots of new little tweaks to make things come together. Mark our words, Disgaea 4: A Promise Unforgotten is making strategy RPGs cool again in all the right ways. While there’s always some focus on hell in Disgaea, the fourth entry dumps its predecessor’s school for one of the biggest stages ever: politics. It’s a smart change, as what brings more drama and controversy to the table than the good old malfeasance of government? The game guides players through the "corrupterment," of the Netherworld with plenty of jokes making fun of pop culture and RPG conventions. We dare you not to smirk when they begin to talk about final boss standbys. Valvatorez is a vampire who was one of the baddest tyrants in the Netherworld, but lost his powers when he fell to Hades. He then finds his true calling... being a Prinny instructor. In becoming the Disgaea equivalent of Nerf Herder, Valvatorez finds himself with his werewolf apprentice Fenrich and not-quite-a-Prinny-cosplayer-but-almost Fuka amongst others. It’s not long before *gasp* corruption is found in the government and a mission begins to have Valvatorez take the throne of the Overlord. The new cast is solid, with humorous dialogue that’s never afraid to be over the top. Some jokes are better than others, but every piece of dialogue has a bit of charm, no matter how bad the jokes get. At points, it’s funny because it's so awful - the question is whether or not this was done on purpose. Only NIS will know, we suppose. NIS also knows well the kinds of game systems they should include in their strategy-RPGs. 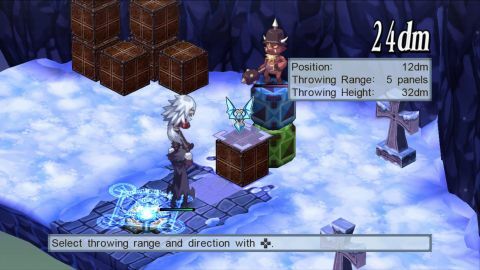 Disgaea is still a grid-based SRPG with lots of movement and tons of customization. With the governmental theme extending to the gameplay, Disgaea 4 goes all out. The classic senate has been bolstered with the Cam-pain HQ, where you can pitch the new bills, which help produce new characters (featuring individual personalities), upgrade items, and gain bonus material. There's also a giant map available, where adjacent characters are more likely to do a combo attack. There are also symbols that can be placed to provide different buffs to your doods. Your Cabinet allows you to appoint allies to a job, giving bonuses, or in cases like the foreign minister, can make your character appear in another player's senate over the PlayStation Network. Why? To come back with items that have been used to bribe them, of course! Whoever said corruption couldn't be fun? Disgaea 4’s online play goes even deeper. You can create maps filled with your characters, Geo Panels, and various objects to challenge other players. But that's not all: pirates are the new bald protagonists (which were the new zombies) and Disgaea 4 follows the trend to allow you create your own ship and crew. You’ll build your boat entirely from the ground-up - head, rear, sides, body - and assign your crew with their own AI settings. Once you upload them, other players will encounter your mighty buccaneers. Want to fight others? Simply turn on the mode and your enemies will appear and engage your ragtag crew all under AI settings - there is no manual control. Not surprisingly, we were impressed with all the creative online options that NIS packed into their flagship franchise. All the Disgaea standbys are present: Geo Blocks, character customization with special skills and evilities, and Magichange all return, though a new feature is the ability to combine two monsters into a mega monster. Note: Giant Prinnies in mirror are closer than they appear. Item world also returns with some tweaks - there are mystery doors with different outcomes and choices to be made about the evolution of your weapon. There are so many systems in Disgaea 4 that this review can't possibly capture all of them. We can easily say that there’s a challenge here and you’ll be able to craft a party that fits your playstyle. This doesn't mean you won't have to grind, but improvements in the item world keep grinding from being tedious. Disgaea 4 never feels daunting or frustrating, and it’s always fun to see what will happen next. The game isn't kidding when it says, "You better check yourself before you wreck yourself." Disgaea 4 isn’t the first in the series to be in HD, but it sure does look like it. While its predecessor kept the low-resolution sprites of the PS2 titles, sprites here are crisp, clear, and sharp. Fans will love the new character models, as they all animate incredibly well, barring a couple of issues. As with previous titles, some attacks zoom in on a specific character - during these, characters will look fairly pixelated, but it’s a small price to pay for the game’s overall ambiance. Aurally, the game is solid, with a surprising amount of variation in its pleasing melodies. The voice acting is decent, if over-the-top, but it matches that aspect of the character designs incredibly well. NIS America may not always get it right with some of their third-party localizations, but like every game developed in-house at Nippon Ichi Software, Disgaea 4’s localization hits a home run. There's not much you can't do in Disgaea 4, and there's also not much to knock about it. It really made us fall in love with strategy RPGs all over again. There’s a lot to love here, but gamers with hatred for Laharl and company won’t find anything to change their minds. At the very least, those who appreciate the series for all that it is will find this entry more than satisfying, as it does everything better than before. And with all the content they've included in this game, this love affair could go on for quite a while. Description Guide your tyrants to overthrow the president of the netherworld.